This Kit Bag was issued to Lance Corporal C.H. Johanson, Service No. 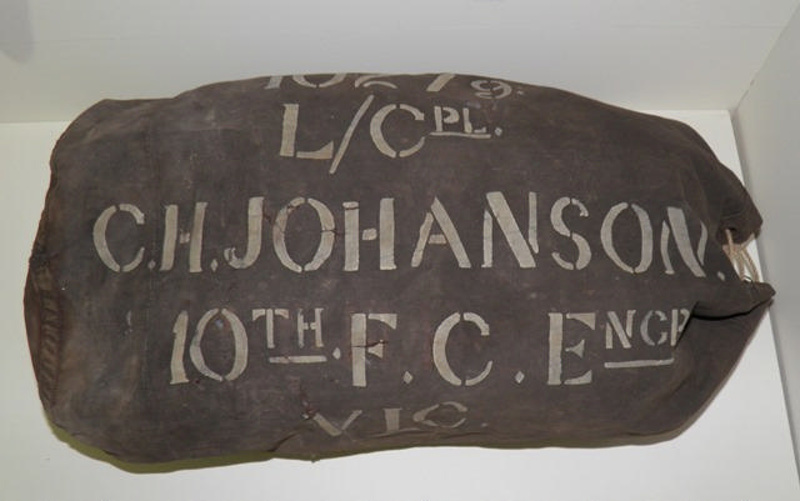 10279, who served as a member of the Australian Imperial Force with the Victorian 10th Field Company Engineers during World War I.
Carl Hamilton Johanson was born in Footscray, Victoria and was 23 years old and working as a Wool Classer when he enlisted as a Sapper on 10 February 1916. He sailed from Melbourne on board HMAT A54 Runic on 20 June 1916 and on 8 October 1916 he was promoted to Lance Corporal in the 10th Field Engineers. In November 1918 he was mentioned in Despatches as a serviceman “deserving of special mention”. 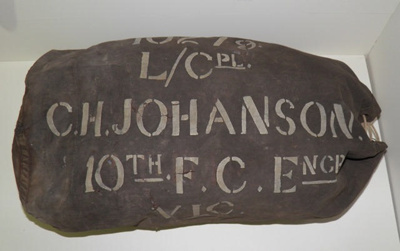 The Kit Bag appears to have been well travelled, accompanying Carl while serving in England and Europe between 1916 and 1918, then arriving in Melbourne in 1919, before accompanying Carl to Sydney in 1921, then to the Western Australia for the next 50 years, before finally coming to Port Macquarie where Carl settled in the 1970s. Possibly it brought back memories of both happy and sad times, and of old mates and unique adventures, and it travelled with him like an ‘old friend’ providing companionship, memories and comfort for him wherever he went. One hundred years later, the Kit Bag is still able to evoke images of service and adventure, and it helps us to admire and respect all those who participated in the War effort. Members of the Field Engineers were especially applauded for their ingenuity and initiative in improving conditions for their fellow servicemen and women, and for providing creative and innovative solutions to difficulties associated with building and maintaining the structures and machines that were essential to the operation of World War I, and to the success of missions carried out by the Allied Forces during the War.